In a country crazy about the yellow metal, demand for gold jewellery fell a whopping 25 per cent year on year in the July-September quarter of CY2017 to 114.9 tonnes while investment dropped 23 per cent YoY in the same quarter. As India is the second biggest consumer of gold after China, global demand retreated as well. Globally, overall demand for gold fell 9 per cent YoY to 915 tonnes in the third quarter while investment tanked 28 per cent year on year. Domestic demand fell due to teething issues related to the implementation of Goods and Services Tax (GST) in July and most consumers rescheduled their gold buying to the second quarter. Also, the government brought the gems and jewellery industry under the ambit of the Prevention of Money Laundering Act (PMLA) in August that mandated know-your-customer documentation for all cash transactions exceeding `50,000. As cash transactions happen to be a norm in rural areas, the demand slumped. The government, however, lifted PMLA in early October. But it is now mandatory to quote one's permanent account number or PAN for any transaction above `2 lakh. The rising lure of equity has also led to a fall in gold demand. Financial assets have been in flavour as is evident from the record amount of investments in mutual funds and due to the recent rally in equity markets. On the flipside, gold exchange-traded funds (ETFs) lost their sheen as an investment class as investors took out more than `420 crore from these instruments during April-October 2017. While the stellar performance of Indian equities has led to a shift in investor preference, analysts think any correction in the equity market could once again prompt gold buying. "People move to an asset class that gave higher returns in the past year. Equity has done well for the past three years, so people have moved there," said Chirag Mehta, Senior Fund Manager, Alternative Investments, at Quantum AMC. According to analysts, gold seems to be in a sweet spot valuation-wise. Equity markets remain near record highs, and most measures of volatility remain near record lows, which means unexpected financial or geopolitical shocks could lead to quick reversals of existing trends. "Such a scenario could benefit gold enormously as it remains undervalued compared to both bonds and equities," said Kishore Narne, Head, Commodity and Currency, at Motilal Oswal Commodity Brokers. Notwithstanding equity performance, analysts see gold demand rising steadily in India. The year 2018 is expected to be relatively smoother as the industry recovers from the initial hiccups caused by changes in reforms and regulations. "This is the initial period and as markets gradually adopt and absorb the GST rates demand should improve as uncertainty around taxes fades," says Jayant Manglik, President, Religare Securities. The market is expected to adapt to GST, and the removal of PMLA may allow demand to recover to a certain extent. In fact, most analysts seem optimistic about gold prices in the second half of the year. 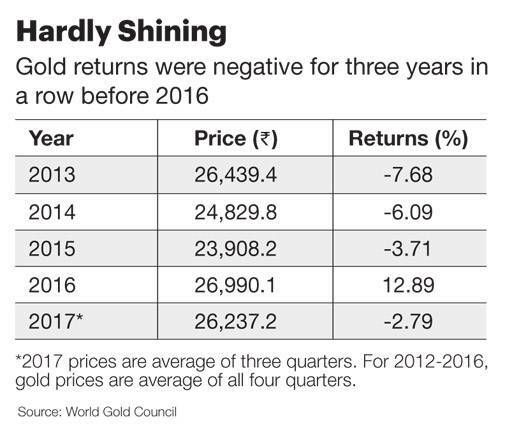 Incidentally, after three years of negative returns, gold came up with positive returns in 2016. On the global front, a rise in US interest rates and strengthening of the US economy spark demand for interest-earning assets such as government bonds and reduces demand for assets such as gold. But analysts think the yellow metal has already factored in the expected rise in interest rates. Over the long run, gold prices factor in the normalisation of interest rates and are more driven by movement in the dollar index and other geopolitical issues, which result in safe-haven buying. "For 2018, the impending rate hike will only have a short-term negative impact and any fall in prices immediately after such hikes will invite buying interest," says Manglik. Moreover, the US Federal Reserve Bank is expected to be slower in hiking interest rates next year. "We believe that gold prices will gradually move higher next year. The Fed will be slower in hiking in rates and may start unwinding its balance sheet - this could take a toll on the US economy and spur gold buying," says Mehta. A gradual recovery by Asian economic giants such as China and India could also increase the discretionary income of consumers and drive the demand for gold. "Physical demand is correlated with a better purchasing power of consumers. So, higher economic growth should spur a pick-up in demand as jewellery remains a dominant component of purchases in India and China," says Narne. Again, the ongoing war of words between North Korea and the US and tension in the Middle East have led to widening geopolitical risks, which could spur buying of safe-haven assets and drive gold prices. Financial advisors recommend that at least 10-15 per cent of the portfolio should be invested in gold as it could significantly reduce risk and enhance the returns of the overall portfolio. Among all asset classes, gold is considered to beat inflation and exchange rate fluctuations in the long run. Also, the performance of gold is inversely related to equity, which makes it an ideal asset for adding diversification to the portfolio. Most believe that Gold ETFs can be a convenient way of investing as they allow people to invest small amounts. ETFs are also hassle-free as they can be held in the de-mat form and investors do not have to worry about theft and storage costs. 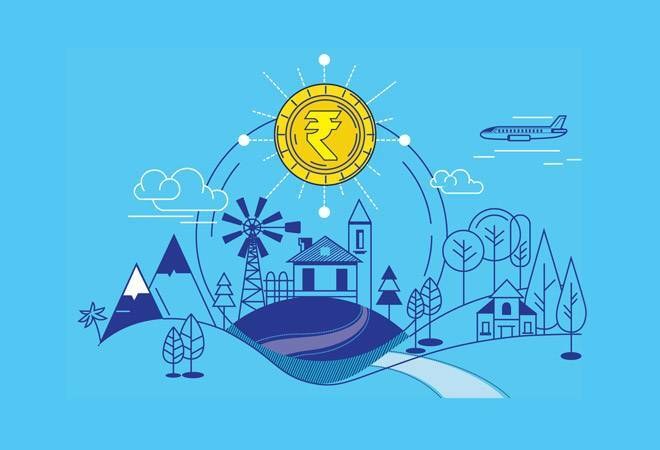 You can also invest in Sovereign Gold Bond schemes, which offer 2.5-2.75 per cent interest over and above the gains made through price movement.